My low poly fox is taking shape. I really love how playful this little fox look.....Even without his eyes :) The background is just for show for now. I should get some ombré fabric soon so I will wait to get them before choosing. I am also working on a secret project..... I am participating in a blog hop very soon....can't wait to tell you more about it but it was wildly inspiring and a great fun. 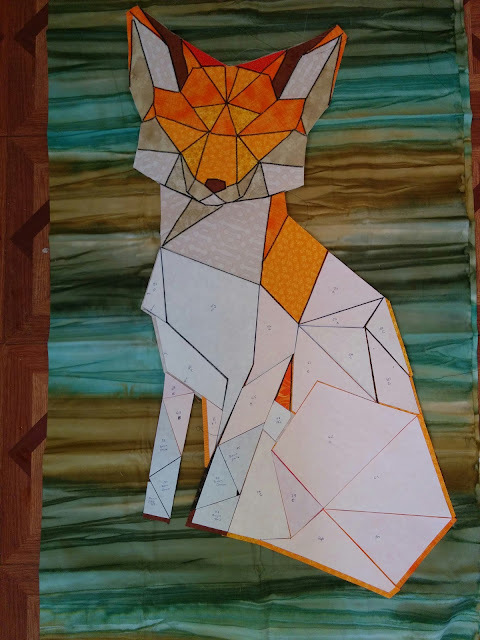 what an amazing fox you are creating, so admire those who do FPP and this one looks extra complicated, think I might just have an idea what project you are working on! Oh I love this....I would love to do something like this in a class and I really love the background as it is. Thank you so much for linking up with Design Board Monday and sharing....I hope you will return often to show your progress! I love your fox already! I sure come back to see your fox finished!! Wow he looks like he's made from stained glass ... wonderful! Fantastic! Looks like stained glass. wow, this is amazing. I would not even try to do something as grand as this. Your fox is amazing. Thanks for sharing a peek. I actually like it against that background, so the ombre will have to be really awesome! Your fox is awesome! Enjoying watching your progress. Ohh, I can't wait to see this piece totally finished! I like the background piece you are showing him on and look forward to seeing him on an ombre piece. You've done a wonderful job with the design of your fox. Thanks so much for sharing him with everyone on Main Crush Monday!! One fantastic fox! Is that a satin stitch to emphasize the seam lines? Looks great! Looks awesome so far! Great choice of fabrics to show depth! Oh my gosh.....this is so neat!